Alex Summers was raised by Mister Sinister and rose to the high rank of Prelate in the Age of Apocalypse. He and his brother, Scott, were among Apocalypse’s most loyal agents. However, Havok was power-hungry and tired of living in the shadow of his more successful older brother. Alex’s contempt for Scott grew much deeper after the two were briefly reunited with their biological father, Christopher Summers. The elder Summers had returned to Earth but was infected with a Brood egg. When he transformed before their eyes, Cyclops killed him with an optic blast. Havok blamed his brother for their father’s death and vowed revenge. Later on, despite his ambitions, Havok fell in love with a human named Scarlett MacKenzie, but kept this affair a secret. Blinded by his obsessive hatred for his brother, Havok didn’t realize that Scarlett was a spy for the Human High Council. When Havok discovered that Cyclops had been secretly helping Sinister’s prisoners to escape to safety, he used this information to orchestrate his brother’s downfall. 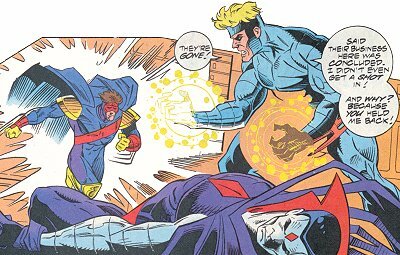 As a result, Havok was promoted within Apocalypse’s ranks and placed in charge of culling Sinister’s pens, a task which he relished. However, his efforts were thwarted by Jean Grey and Cyclops. Infuriated, Havok pursued the two and attempted to kill them both, as bombs sent by the Human High Council rained down on North America. He did not have much time to enjoy his final victory over his brother, as he was killed by Weapon X just moments before the bombs hit. 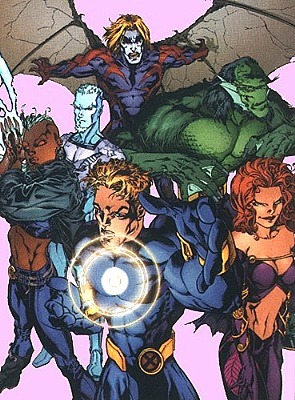 In later years, Havok was resurrected using the power of a Celestial Lifeseed, becoming Minister of War. He served Weapon Omega, a version of Weapon X who ascended to become the successor of Apocalypse after exposure to a Deathseed. In a Battleworld realm similar to the Age of Apocalypse, Alex served as deputy leader of Apocalypse’s Elite Mutant Force. Much like in the AoA, he was raised by Mister Sinister and had a fierce rivalry with his brother. After being injured in an attack by the X-Men, Havok was healed by McCoy and his assistant, Doctor Nemesis, and given a new costume. While he was healing, the humans unleashed a mutant-killing Legacy Virus, secretly created by Doctor Nemesis. Together with his brother Cyclops and his newly discovered brother Adam, he fought against the powerful Nemesis and was powerless to stop Adam from sacrificing himself to save his brothers. Later, when the Phoenix was raised to cure the virus and destroy Nemesis, she stripped away the abilities of all mutants in the Doman of Apocalypse. In the alternate reality shown in What If? (2nd series) #74, Havok and Cyclops were too raised by Sinister as he got to them before Xavier did. In this timeline, it was Sinister who created the X-Men, which consisted of Cyclops as the team’s leader, Madelyne Pryor, Sauron, Sabretooth and Havok. Alex and Scott were very close and there appeared to be no jealousy between them. Eventually, Sinister received word of a new mutant he wanted to add to his X-Men: the weather-controlling mutant called Storm, and sent his X-Men after her, only to be confronted by the mutant students that Xavier had assembled. A fight ensued and feeling a certain attraction to Jean Grey, who was on Xavier’s team, Cyclops hesitated to attack. The prolonged battle provided the perfect opportunity for Magneto to break through Sinister’s protective shields and kill him in revenge for an earlier defeat. When Alex returned to the base and found their dying mentor, he at first blamed Scott to be a traitor. But, with his final breath, Sinister made Alex understand that it wasn’t Scott’s fault. He just wanted the two brothers, who he saw his sons, to continue his work. Some time later, Scott and Alex apparently infiltrated Xavier’s students, perhaps with plans to destroy them from the inside out. A timeline that diverged at an even earlier point was depicted in What If? (2nd series) #90. There, Christopher Summers managed to rescue his entire family before they could be abducted by the alien Shi’Ar. Life went on for the Summers family, and Alex and Scott grew up together. However, even being raised by his own parents didn’t do anything about Alex’s jealousy towards Scott. Alex was a good basketball player, but his big brother always got picked first and managed to win all the trophies. When Scott’s mutant powers manifested, all the attention went to him and Alex got even more jealous and ran away from home. When Alex hid in a farm barn, he was approached by the Dark Beast, who pretended to be his friend. Alex became his prelate and told the Beast everything he could about Scott’s growing power. Things changed when Professor Charles Xavier tried to invite Scott to his school and he refused. Alex informed the Dark Beast of this, who then asked Alex to bring Scott to him. At first, Scott was scared of McCoy, but the Beast didn’t give up and continued to charm the boy. Seeing his only friend too giving his brother so much attention, Alex got angry and manifested his own mutant power. The Beast agreed to leave Scott alone, if Alex continued to work for him. Over time, Alex did a lot of unpleasant missions for the Beast, only to eventually realize that McCoy wasn’t his friend, and never was. Although he never felt more alone, Alex continued to serve the Beast to protect his family. The Alex Summers of the Mutant X universe led an entirely different life. In this reality, Alex was the sole member of the Summers family to escape abduction by the alien Shi’Ar and, more or less, he lived the life of the main universe’s version of Cyclops. Here, it was Alex who was one of the original X-Men and eventually became team leader. He married Madelyne Pryor, and they named their son Scotty, after Havok’s presumed dead brother. After he had a falling out with X-Men over accepting Magneto as their leader, Havok formed his own team of heroes, dubbed “The Six,“ including Ice-Man, the Brute, the Fallen, Bloodstorm and his wife, Madelyne, aka Marvel Woman. During one fight, this Havok sacrificed himself to save his wife from a Sentinel attack. However, the main universe’s Havok (616) having a similar death experience, their minds were apparently exchanged. The 616 Havok continued Mutant X Havok’s life, the Mutant X one found himself trapped in the comatose body of his counterpart. Only some time after 616 Havok returned to his own body did the Mutant X version make his presence known, as he tried to take over. He was stopped by the band of reality-hopping mutants called the Exiles and his psyche was destroyed by the mysterious Timebroker. In the alternate future timeline known as Earth X universe, every human being on Earth gained superpowers when the Inhumans’ Terrigen Mists was released into the atmosphere. No longer needed as heroes, and not liking the many changes, Havok and Polaris fled Earth and accepted Corsair’s invitation to join them in outer space, aboard the Starjammer. They often asked Cyclops to join them as well, but time and again he refused, having found himself a new purpose in training another team of outcasts. Havok briefly returned to Earth long after the threat of the Celestials had passed to attend the wedding of King Britain and Medusa. A significant difference of the Ultimate version of Havok is that he is Cyclops’ older brother. Alex was one of the many candidates Emma Frost had in mind for the president’s own mutant team, just like his girlfriend, Lorna Dane. However, due to Magneto’s latest attack, the president refused to have people with magnetic powers on his team. Alex was approved, though, and apparently ended his relationship with Lorna for this opportunity. Upon joining the government team, Alex was given his very own costume and adopted the codename of Havok. However, shortly after the team was assembled, they were attacked by newly built Sentinels, sent after them by another branch of the government. Afterwards, the members of Emma‘s team briefly stayed at Xavier’s school for a while, giving both Havok and Cyclops a chance to catch up, as they hadn’t spoken to each other since Scott became an X-Man. The rift between them was deepened by Havok’s jealousy of Scott’s celebrity status. When Emma Frost returned to her school in Massachusetts, Alex tagged along with her, eager to meet Emma’s other “hellion” mutant students. Without government oversight, Alex and Lorna were free to reunite, and became charter members of Emma Frost's Academy of Tomorrow. When Magneto responded to the death of his daughter Wanda with worldwide terrorist attacks known as the Ultimatum Wave, however, the Academy was targeted. A series of Madrox suicide bombers attacked the Academy, killing Emma and Lorna among many others. Alex survived the attack, but fell under the hypnotic influence of Sinister for a time, believing his dead brother Scott was still alive. In one possible future, Havok’s Unity Squad failed to prevent the rise of the Red Onslaught. The Red Skull used stolen psychic powers to amass a black dossier of mutant crimes, using them to stir up hatred against mutantkind. He rounded up mutants into internment camps on Geonsha and unleashed sentinels on the world. It is unknown what happened to the other members of the Unity Squad but Havok, Scarlet Witch and Sunfire managed to survive and elude capture, hunting for a means to undo what had happened. They eventually located a message from the long dead Immortus before being captured by the Red Onslaught. When Wolverine travelled back in time to prevent the apocalyptic Age of Ultron, he ended up killing Ultron’s creator, Hank Pym, creating a reality where the Avengers disbanded early and Morgan LeFay lay siege to the Earth. 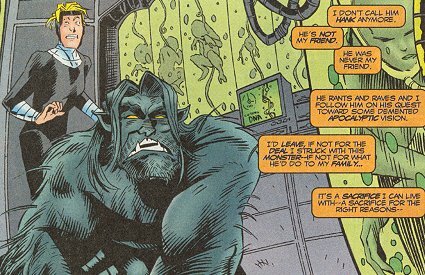 Havok was leader of the Morlocks, living in the sewers of New York with his wife Rogue. When Colonel America came looking for Caliban, to bring him to trial for a crime, Alex turned him away. The Colonel soon came under attack from the time travelling Apocalypse Twins and Havok stepped in to defend the man, only to be bisected for his troubles. In one realm of Battleworld, the X-Men failed in averting the Inferno, though they did manage to prevent its spread by encasing Manhattan within a dome of magical and scientific energy. As Madelyn Pryor’s Goblyn Prince, Havok was trapped within this dome for five years and helped his queen in the ongoing battle to reclaim her throne from Illyana Rasputin, as well as raising her young son Nathan. The Goblyn Queen formed an alliance with Colossus’ X-Men against Illyana’s forces. Later, when they encountered Mister Sinister, the Queen’s creator, the subsequent fight resulted in Havok sacrificing his life to save Madelyn’s. Elsewhere on Battleworld, after the X-Men ended Cameron Hodge’s X-Tinction Agenda on Genosha, Havok and Wolfsbane elected to remain and held rebuild the nation. During this time, the pair fell in love and started a relationship. Years later, an extinction plague swept the island’s mutate population and Genosha was placed under quarantine. Desperate for aid and with the X-Men refusing to break the quarantine, Havok lead a desperate mission to attack their former friends and kidnap Triage and Rogue to heal their population. Naturally, the X-Men retaliated, leaving to a heated battle in the streets of Genosha when they came to retrieve their people. During the battle, the villainous Cameron Hodge made a surprise return, unleashing hell with his new techno-organic body. This forced Havok and his lover Wolfbane to sacrifice their lives to kill the man. In a reality featured in New Exiles #7-11, the world was divided between the French and British Empires, which had been warring for centuries. As an agent of the French, Havok launched a terrorist attack on the British-allied Avengers, using his powers to blow their mansion to pieces, killing many of them. The intervention of the Exiles stopped him from causing any further damage. In What If... Magneto and Professor X Had Formed the X-Men Together?, Havok along with Cyclops and Sabretooth, became a member of the Marauders. Because he worked for Mister Sinister, he never joined the X-Men or Xavier’s School and lived his life as a villain.